Your vehicles electrical system is a fundamental part of a running car. It is a very complex network that requires specialized diagnostic equipment to identify the root cause of what is going on. Specialized equipment is able to communicate with your vehicles computer to understand the exact problem that is present. . 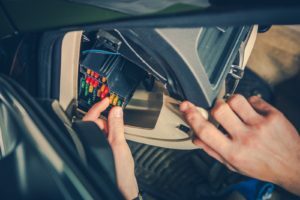 Being that there are many components that make up the electrical system of your car, including your car battery, battery cables, alternator, starter, and computer system, electrical problems do not always immediately present themselves. An electrical short or other issues can be very hazardous if present. Cars nowadays do have far less electrical issues, however being that electrical problems are harder to diagnosis, we can not stress enough how important it is to work with a qualified auto repair shop and experienced electrical mechanics. Here are a few signs that may indicate you are having electrical problems with your car. If you are experiencing any of these signs please contact us and schedule a time to bring your car in. We will diagnosis what is going on and provide you with the best solution to fix it.